Ali Moeller is an ambassador of world languages in every manner. She advocates for them. She sings their praises. She encourages others to pursue them. She represents them. And she teaches others to do the same. As president of the American Council on the Teaching of Foreign Languages (ACTFL), Moeller, spent 2018 traveling the U.S. and beyond to share the important benefits of learning and teaching a second language. In a world of political and international relationships that seem more fragile every day, more people who can speak multiple languages seems like a logical pathway to understanding and improving fragile relationships. 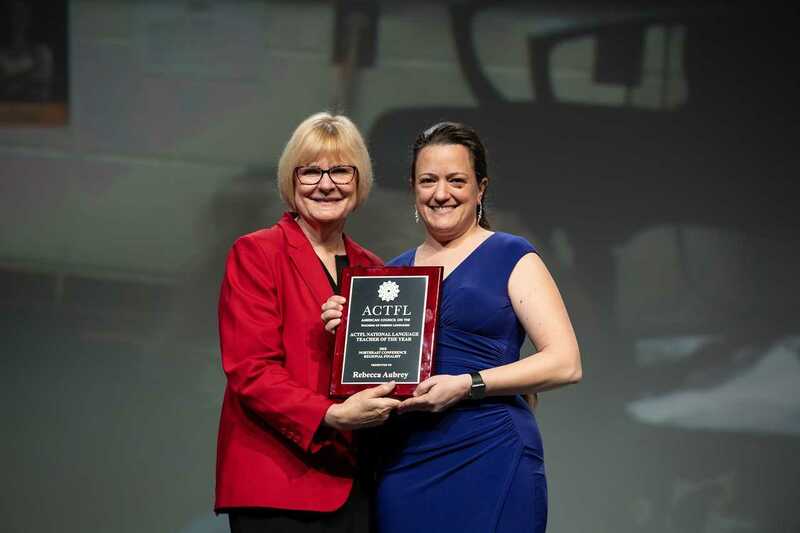 Moeller, Edith S. Greer Professor of Teaching, Learning and Teacher Education in the College of Education and Human Sciences at the University of Nebraska–Lincoln, felt it a privilege to have the opportunity to help lead ACTFL’s efforts during a time of growth and progress. She presided over the organization’s annual convention in New Orleans in November and delivered a keynote address that can be viewed online. In the past year she has also delivered keynote addresses and workshops at state, regional and national conferences across the U.S. and around the globe. Her work as ACTFL president has helped strengthen relationships with the world language organization in South Korea (KAFLE-Korean Association of Foreign Language Education) where ACTFL has expanded language assessment services, and in Europe (ECML—European Council on Modern Languages) where exciting new collaborative research studies and efforts are underway on language learning and teaching. In addition to building understanding among different cultures, Moeller says that research has shown numerous benefits to learning a second language. Some of these benefits include significant cognitive benefits such as higher executive functions, delays of onset of Alzheimer’s by 4 to 5 years compared to matched monolingualism, and intercultural competence and enhanced opportunities for economic gains in career choices. Moeller also serves as a world language ambassador through her role as a professor of language education—preparing a new generation of educators and ambassadors to carry the torch for language learning and teaching. On her travels as an ambassador for world languages, Moeller has also been a productive recruiter and representative for the University of Nebraska–Lincoln. She has recruited doctoral students to Nebraska from around the world, increasing campus diversity and accomplishing academic outreach at the same time. She has also led study abroad opportunities to immerse Nebraska students in other languages and culture.